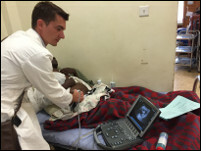 Thanks to the generous support of the Benjamin H. Josephson, I spent 6 weeks in East Africa, teaching point-of-care ultrasound to front-line physicians at two of the region’s busiest hospitals. The majority of my time was spent in Uganda at Mbarara Regional Referral Hospital (MRRH), a major trauma and obstetric center in the southeast of the country. Unfortunately, this hospital has extremely limited diagnostic imaging capacity. While basic radiographs are usually available, the CT scanner, when functioning, is reserved only for the extreme minority of patients who are able to pay. In this setting, point-of-care ultrasound allows trained providers a cost-effective, efficient, and safe means of rapidly diagnosing acute and dangerous conditions. With 3 other volunteer physicians from the PURE initiative (Point-of-care Ultrasound in Resource-limited Environments, www.pureultrasound.org), I helped to conduct an intensive training seminar on the fundamentals of point-of-care ultrasound for trainees in surgery, medicine, and obstetrics. For four weeks after our seminar, I remained at MRRH guiding and supervising a hand-picked group of promising trainees as they honed these new skills. In the emergency department, our FAST exams routinely uncovered occult abdominal bleeding and trigged life-saving surgical interventions. On the surgical wards, our trainees became confident in recognition of DVT in their post-operative patients. Among the medicine residents, procedural guidance with ultrasound improved the safety and efficacy of taps for pleural, abdominal, and pericardial fluid. Our eagerest trainees included a group of senior midwives who, thanks to multiple visits from PURE trainers, are now skilled enough to begin training first and second trimester obstetric ultrasound to their juniors, satisfying our mission of creating a sustainable point-of-care ultrasound capacity at this institution. I am thrilled to have been able to participate in this vital partnership between PURE and MRRH, serving patients in need today and building sustainable capacity for the future thanks to the mission and support of the Benjamin H. Josephson Fund.